BOSTON, MA -- The regular season has come to an end in the Eastern Hockey League Premier (EHLP). This past week featured 14 intriguing matchups, as the teams finalized their seeding for the EHLP Playoffs. With 12 to of the 13 teams in action, there were plenty of worthy candidates for our weekly honors. 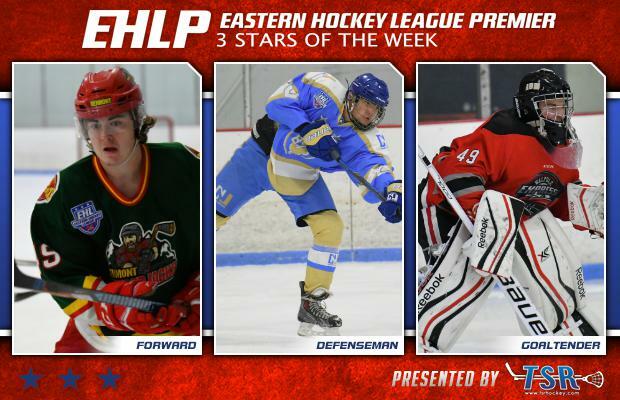 The EHLP is pleased to announce that Jason Vogel (Vermont Lumberjacks), Tim Lazouski (New Jersey 87s), and Christian Pelligrino (Walpole Express) have been named the TSR Hockey Stars of the Week. The first round of the EHLP Playoffs will start tomorrow afternoon. Catch the #Eshow playoff action live on HockeyTV. Vogel and the Lumberjacks won their last two games of the regular season this past weekend against the Jersey Wildcats. The '98 led the way on Saturday with a six-point game, followed by a goal in Sunday’s game to give him six goals and an assist for the weekend. The native of Mclean, VA, finished the regular season with 21 goals and 10 assists (31 points), and those numbers included three game-winning goals. The Lumberjacks ended their regular season as the #2 seed and will be facing-off against the #3 seed Walpole Express in the Second Round of the EHLP Playoffs this Saturday night at 6:00pm. Lazouski and the 87s won all four of their games this past week to finish off their regular season. The 2000 born defensemen, led the way from the blue line with four assists in his team’s 8-0 win against the New York Applecore on Tuesday. The native of Belarus, then scored the game-winning goal in Saturday’s matchup with the Applecore as well. After the six-point weekend, Lazouski finished off the regular season with 6 goals and 21 assists (27 points). 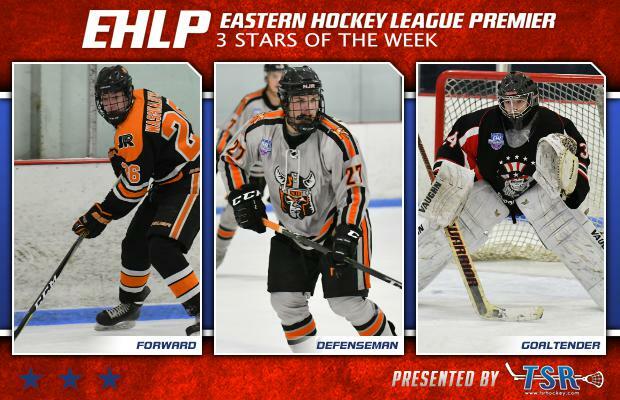 This is the defensemen’s second EHLP weekly honor of the year, earning an TSR Hockey Star of the Week award back in Week #20. The 87s have locked up the #2 seed and will be taking on the Philadelphia Revolution in the Second Round of the EHLP Playoffs. Pelligrino owned a 1-1-0 record this past weekend as the '99 was between the pipes for both games against the EHLP Regular Season Champion Boston Jr. Rangers. The native of Arnold, MD, won the first matchup on Saturday, stopping 33 shots in a 3-2 victory. Pelligrino and the Express fell on Sunday by a 2-1 score, despite the goaltender’s 36 saves. The '99 finished the regular season with 10 wins to go along with a 3.38 GAA and 2 shutouts. The Express have locked up the #3 seed in the EHLP Playoffs and will be taking on the #2 seed Vermont Lumberjacks on the road in the Second Round. The EHLP would also like to recognize a pair of honorable mentions this week, starting with Geodon Buffoline from the Vermont Lumberjacks. The '99 recorded a goal and seven assists in two games against the Jersey Wildcats. The New Jersey 87s leading scorer, Jack Lane, finished off the season strong with three goals and six assists (nine points) in his team’s final four games this past week.